Wibu-Systems extends its latest "B" series of hardware-based dongles with CmStick/BMI: secure, portable, multi-vendor, and durable. Wibu-Systems was already known for having the broadest hardware secure element family worldwide. At SPS IPC Drives, taking place in Nuremberg, Germany, November 27 to 29, the leading vendor in secure license management will present the all-new CmStick/BMI at its exhibit 660, hall 7. The proprietary hardware license container lineup of Wibu-Systems comprises USB dongles in various styles, secure memory cards (CF, CFast, SD, and microSD), and ASICs. Their first dongles made their appearance on the market thirty years ago when the company was founded. Over the decades, they have gone through a number of generations to keep their performance and security levels at the very top. It was last year when Wibu-Systems announced a complete re-engineering of its CmSticks and started offering the new members of the “B” family one by one. After the CmStick/B and /BMC, respectively the variants without flash memory and with MLC (multi-level-cell) flash memory, Wibu-Systems now adds CmStick/BMI, the version with pSLC (pseudo-single-level-cell) flash memory. All three units have their robust and elegant metal casing in common: compact in size, easy to remove from the target device when the license has to be operated from a different endpoint, sturdy in design with the USB connector fully integrated into the body of the unit thanks to SiP technology, and completely- customizable to support all branding needs. As a whole, the three devices meet the technical requirements of commercial and OEM grades. SLC flash memory for industry-grade dongles is still available on board the CmStick/MI and all Wibu-Systems CmCards. Even though industry analysts had forecast their imminent demise again and again, hardware dongles of all shapes and sizes remain a favorite for developers and users alike. The protection they offer against counterfeiting and reverse engineering is far superior to any soft or cloud-licensing technology; the license portability that comes from simply unplugging and re-plugging the dongle cannot be paralleled; and only hardware dongles allow multi-vendor support. 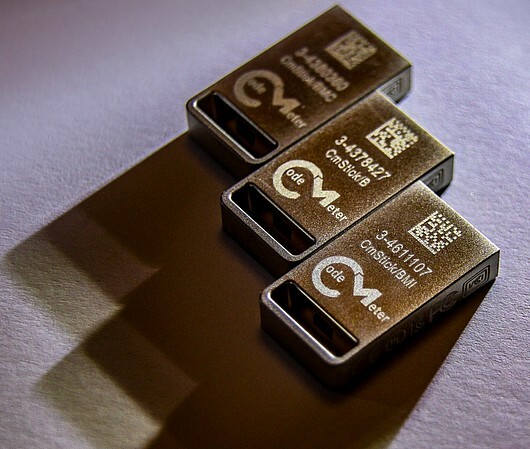 When dongles come with flash memory on board, the memory itself can also be partitioned into up to four areas to enable additional uses: CmPublic with full read and write rights, CmSecure where data can only be accessed in blocks via a CodeMeter API, CmPrivate, a password protected and encrypted partition, and CmCdRom, which the host system recognizes as a write-once CD drive. At SPS IPC Drives, Wibu-Systems will show several automation-specific applications typically realized with dongles. In the secure password management solution for the Siemens TIA Portal®, CmDongles are used as secure elements for password storage in combination with CodeMeter License Central, the cloud and database-derived solution for license lifecycle management, CodeMeter WebDepot, the user portal for license activation, CodeMeter Keyring for TIA Portal, the tool for password and entitlement management, and CodeMeter Password Provider, the interface module between CodeMeter technology and the TIA Portal. For a separate demonstration, Wibu-Systems has built the dongle into a cocktail mixer. In this case, the Infineon crypto-controller that comes with all CmDongles is the principal actor: with Wibu-Systems cryptographic methods, it is the key component responsible for preserving the integrity of technology data on its travel from the cloud where it is sold to the machine where it is licensed.